What’s even more amusing to me is how wonderful, how instantaneously better I feel about everything as soon as I do allow myself the time of day to prepare a quick meal, to sit down, and to enjoy food. Suddenly that long list of tasks doesn’t look so daunting; those messages on my phone not so overwhelming. Balance restored. Eric and I came home from the farmer’s market a few weeks back and my stomach was roaring. And I was edgy. Eric’s learned this about me. 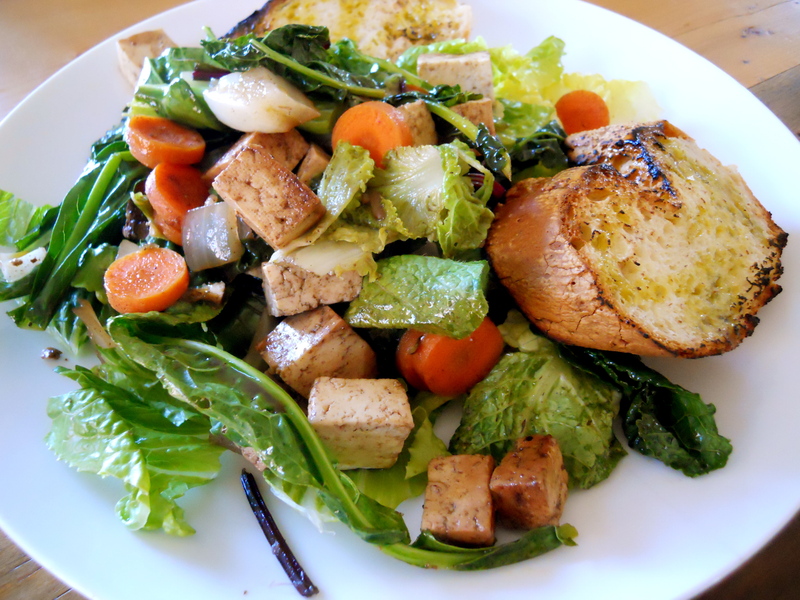 So we quickly sauteed some cubed tofu, chopped onion, and sliced carrots in a bit of wine vinegar and tamari, added a pound of searing greens to the pan, then put this over a bed of romaine lettuce. We cut thick slices of gluten-free bread and toasted them over the open stove top flame, then drizzled everything with olive oil. A sprinkle of salt and pepper, we sat down to eat, and by the end of the meal, well, I went outside and hung up the laundry before the afternoon rains arrived. As the end of August quickly approached and passed this last week, I noted that I had let a whole summer (read: a summer in Tucson!) 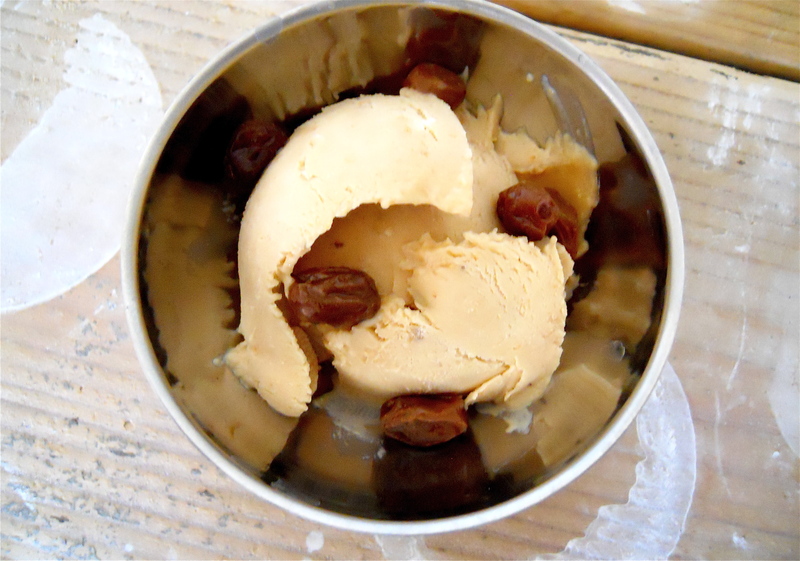 go by without once making the notorious treat of summer: ice cream. Sure, I could have taken a moment of pause to reflect on the reason behind this phenomenon: How is that even possible? But, to be honest, I just shrugged and moved on. You see, given a choice, I could live without ice cream. If I’m told to choose between ice cream and a smoothie, I’ll take the smoothie any day. 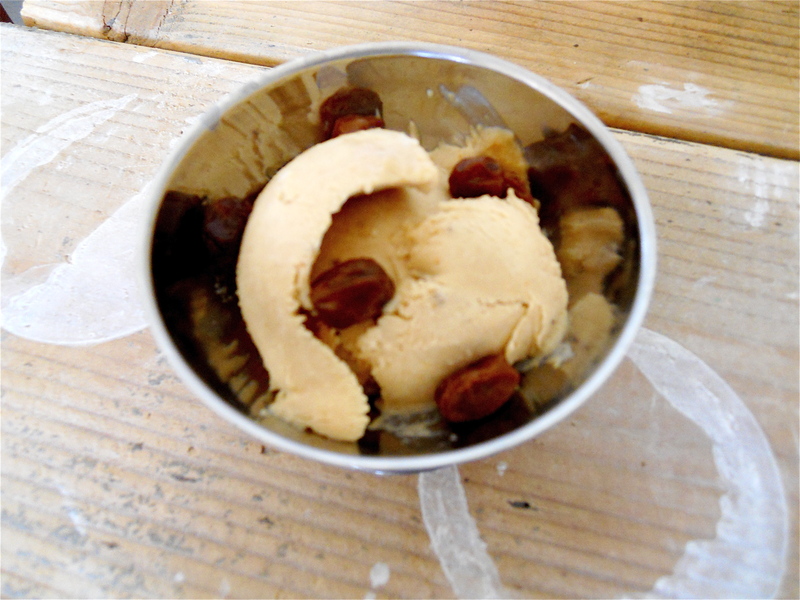 The idea of having a bowl of ice cream for dessert has long lost its appeal for me. (I’m sorry–I realize that by now I may be in very deep water with some readers out there.) If, on the off-hand, I do have a few scoopfuls, the chances that I’ll either be up all night or having some really weird dreams from the sugar is pretty much a given. So imagine my sheer joy when, a couple weeks ago, Eric and I were invited over to share a meal with some new friends and I learned that the delicious ice-cream-like dessert they had just placed in front of me was nothing more then bananas mixed with peanut butter, frozen, then served with a topping of alcohol-soaked raisins. To be fair, I thought afterward, there were many things about that evening that could have just made me partial to the dessert. There was the fact that these friends had spent a good amount of time researching, then executing for the first time, an entire meal that was completely free of meat, dairy, and gluten. There was the wine with dinner, my first indulgence since the infamous Month of Mono. There was the five-foot candle holder placed at the head of the table, which I enjoyed without shame. There was the beautiful presentation of green curry and white rice. There was the record player and the 25-pound cat who, by the end of the evening, I’d managed to get into my lap. And there was the 4 1/2 hours spent just sitting around a table, getting to know each other while sharing a singular meal. All this, and then the dessert. Who wouldn’t be partial? So before we left that evening, I knew I was going to have to test the dessert again in a more objective environment. The long and short of it: I did, and I wasn’t disappointed. I made my own version (below) and Eric and I had it after lunch one day with another friend. The best part about this dessert? 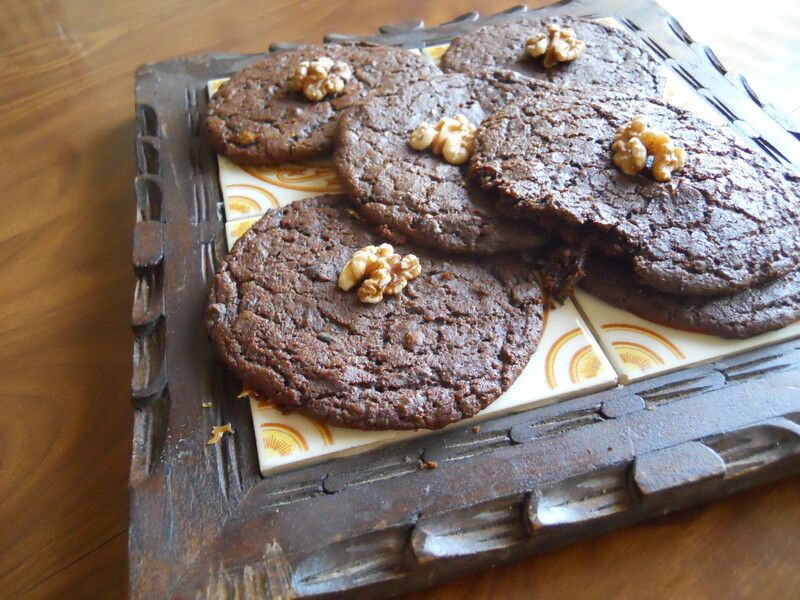 Because it only consists of banana and peanut butter (no added sugar necessary! 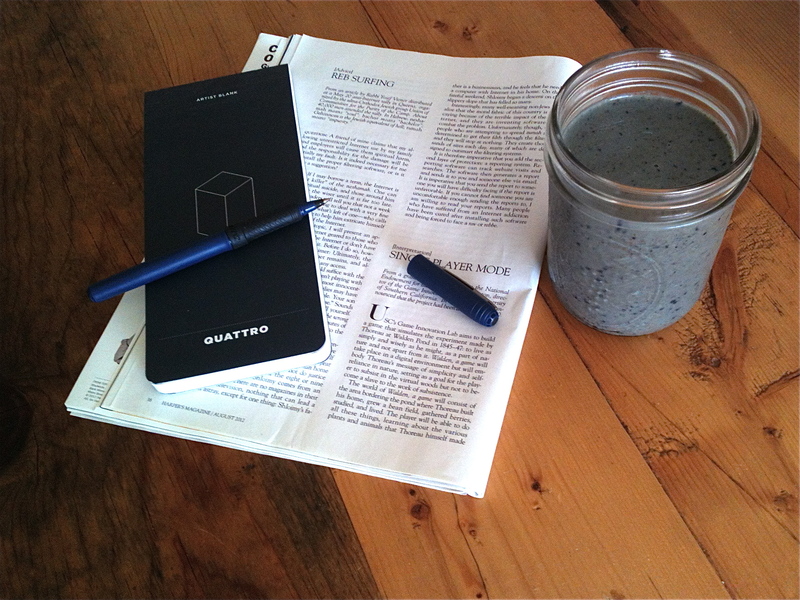 ), I added it to my smoothies in the morning and blended it with my usual concoction of spinach, kale, and berries. I’ll say no more. Happy end of summer, everyone. 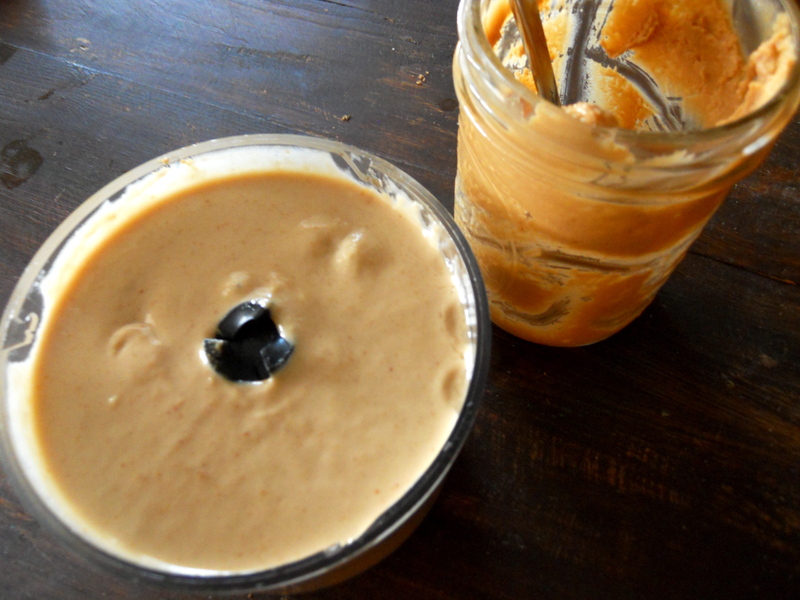 Next, combine your peanut butter, bananas, and vanilla (if applicable) and blend thoroughly with a food processor. Your mixture should be thick and smooth. 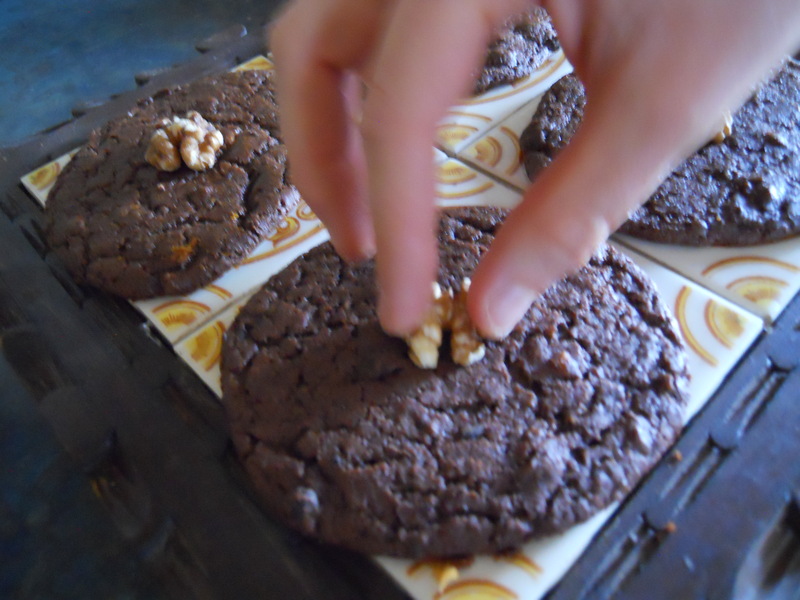 Using a spatula, scrape out mixture into a glass or freezer-safe container and freeze for at least an hour. 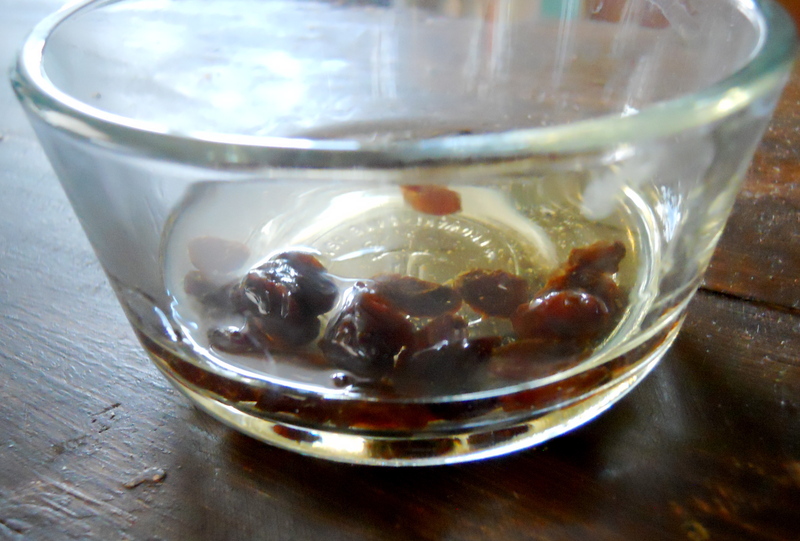 When ready, you should have a really nice frozen dessert, one you can scoop out into little dishes and top with raisins and the leftover alcohol. Serve immediately. 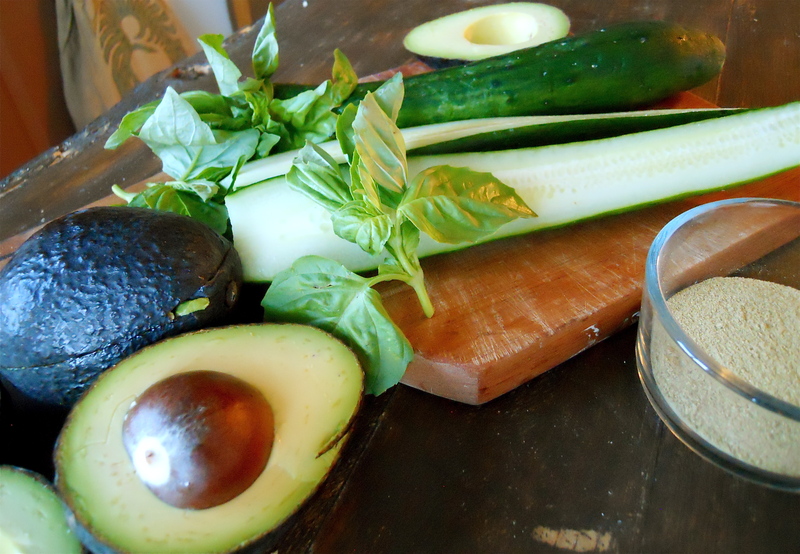 *I plan to add avocado to my salad and serve it over a bed of spinach or baby arugula. I’m a huge fan of pickles. When I was a kid, my mom would pick my brother and me up from our after-school program and we would all head to the small, local market. Over the deli counter rested a huge glass jar of whole dill pickles, and my mom would buy one for the three of us to share as we shopped. It came wrapped in a napkin, but by the time we had each taken a bite, the thin piece of paper was quite useless and our fingers were covered in brine. I give my mom a lot of credit for this brilliant parenting strategy: my brother and I were so distracted with that pickle that we were usually able to bypass the sugary cereal aisle without a complaint, and I don’t remember every being hungry by the time we ended up at the register where all the candy bars were. We were in-and-out of that store and back home making dinner in record time. Way to go, Mom! 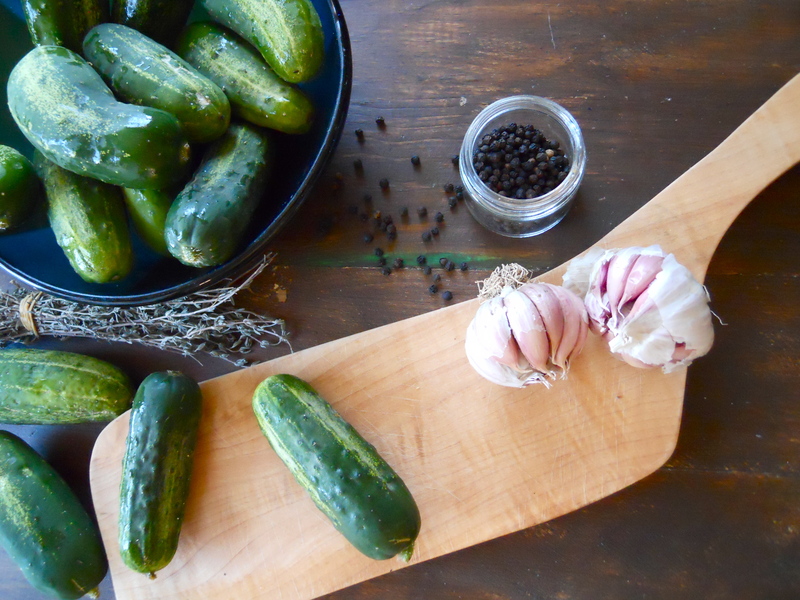 To this day, nothing beats a cold pickle, eaten right from the jar, on a hot day or during a backyard BBQ. 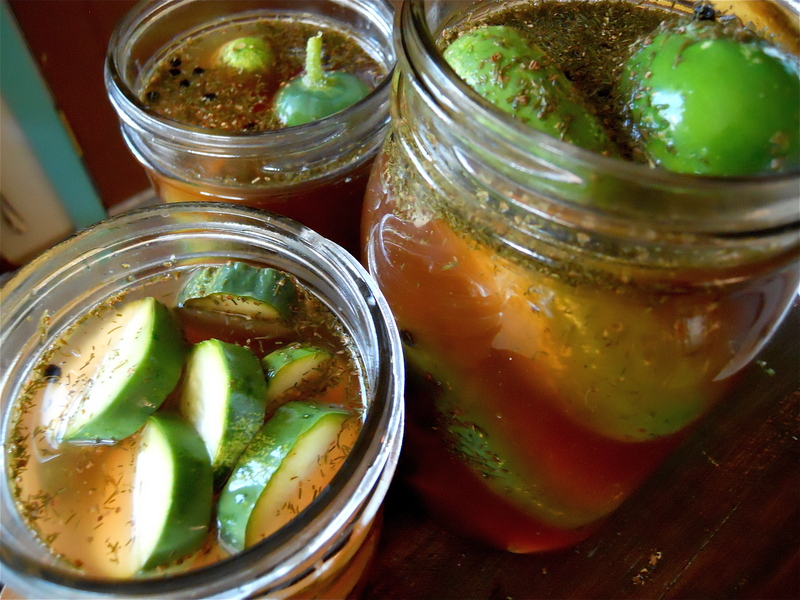 So yesterday, knowing that we were headed toward both (hot/sunny, BBQ with friends), I quickly made a few Mason jars of pickles to take over and enjoy. I typically use the recipes straight out of this book, which I found to be a great introduction to the various processes of canning and preserving. 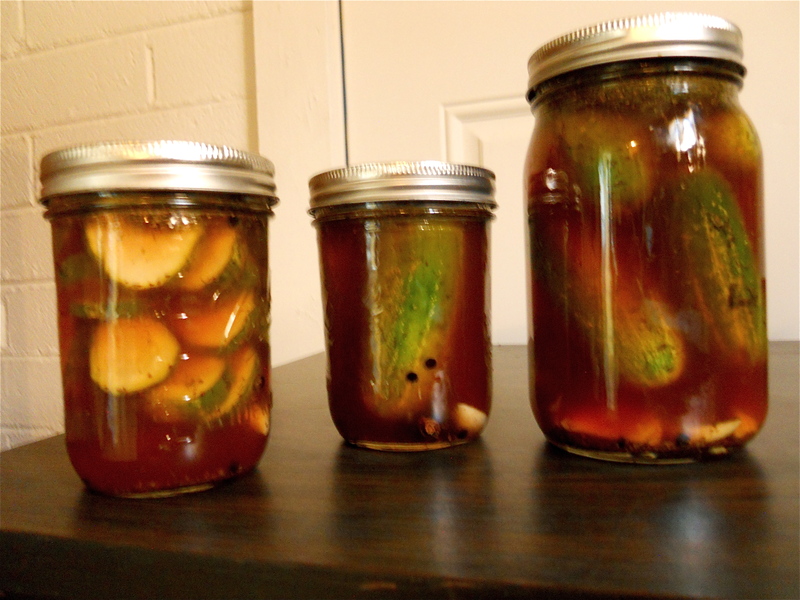 Today I adapted the recipe for Basic, All-Purpose Brine and packed my jars full of local pickling cucumbers. I played around with my vinegar, opting for apple cider vinegar instead of white vinegar, and I skipped the horseradish and substituted dried chipotle peppers for the recipe’s suggested cayenne pepper. Combine vinegar, 1 cup of water, sugar, and salt in medium saucepan and heat until the sugar and salt are completely dissolved and the liquid begins to boil. Turn down the heat but keep a simmer going, then prep your jars. 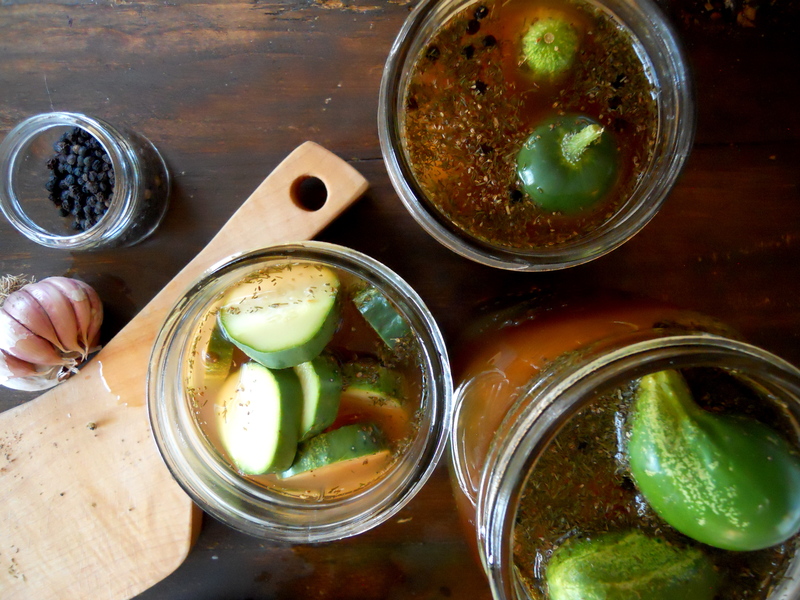 Add the following to each of your pint jars (double this amount for quart-sized jars): 6-10 peppercorns, 1/4 teaspoon celery seed and dill (measurements are for dried herbs), 2 garlic cloves, 1 dried pepper. Pack vegetables tightly in the jars. You can also slice the cucumbers into coins if you like. Then pour your brine into the jar and fill to 1/2-inch headspace. Screw on lids and continue to follow the sterilization process or, if you want to be bad like me, throw them in the fridge and eat them within a couple weeks. *I’m planning to roast my eggplant. Here’s a link to instructions. 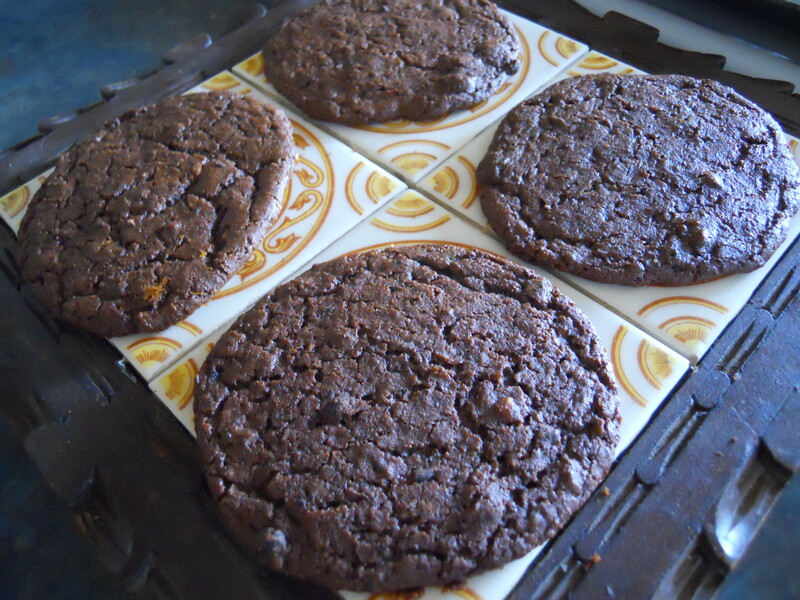 Preheat oven or convection oven to 350 degrees. In a large cast-iron skillet, heat oil and squash (onions, too, if you like) and saute about 20 minutes, until squash is soft and beginning to brown. 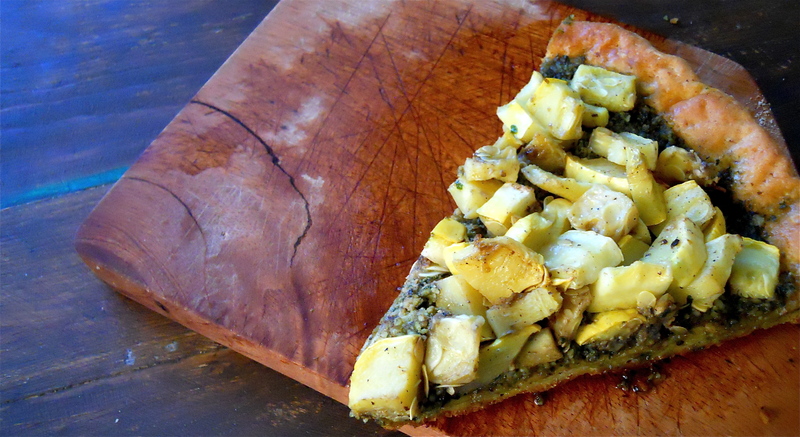 Generously cover pizza crust with pesto, then top with squash. 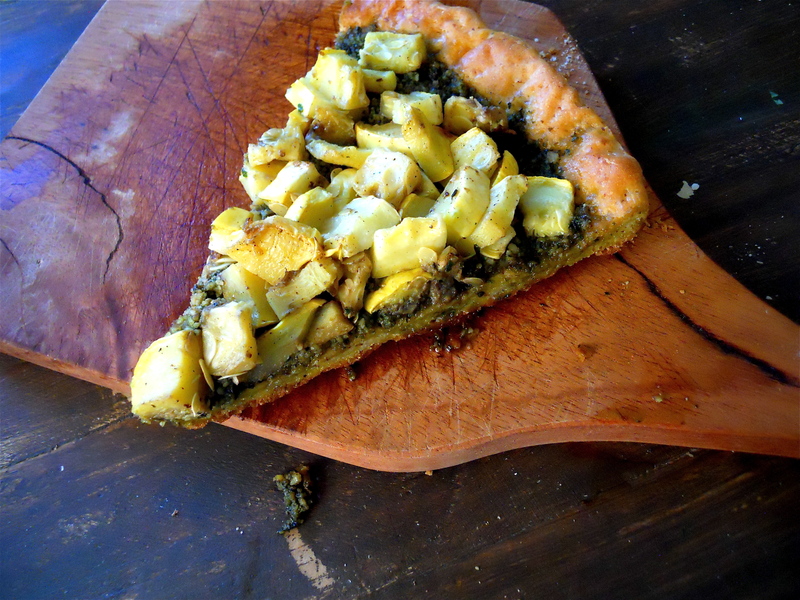 Bake in the oven for 15 – 18 minutes, until pesto is bubbly and crust is golden brown. Slice and serve warm. I’ll admit it: when the thermostat and weather report both show a week of 104 degree weather (I think the high last week reached 109! ), that’s when I finally give up turning on the stove–even for my morning tea ritual. 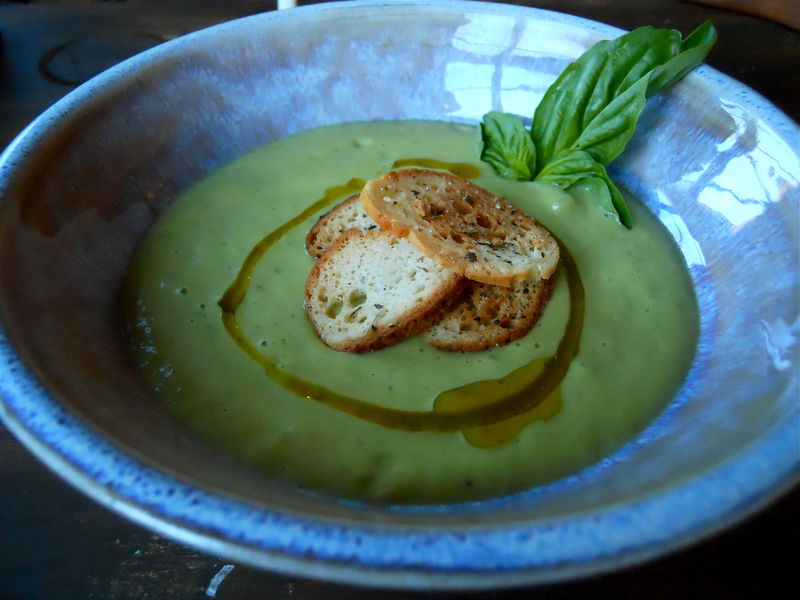 Not to despair, though: enter cold soups and the ever-handy immersion blender. 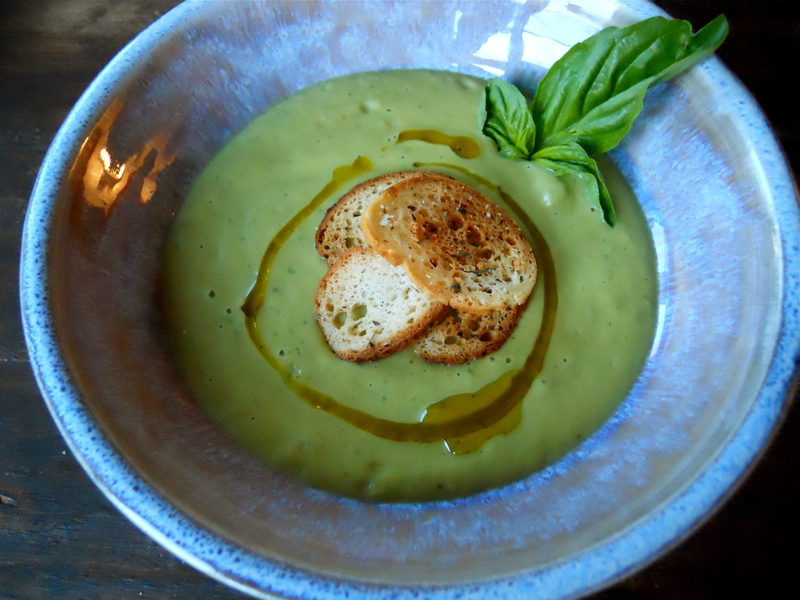 Two weeks ago I used it almost every day (and continue to do so) for blending my breakfast smoothie; this past week, I used it to make one of the best cold soups I know and love: Avocado-Cucumber Soup, a creamy and completely satisfying meal for days that just don’t cool off. Here’s the recipe I’ve adapted and changed over the years. The secret spice I use? The powdered Mild Green New Mexican Chiles blend from this store in Boulder, CO. Whenever we visit family in that neck of the woods, I always make sure to stock up on this spice. If, however, you just can’t justify shipping spices across the country or hopping on the next flight to Colorado just for a spice run, I completely understand. Chile spice blends are pretty common in any co-op or natural foods market, or go a completely different route with the spice: try a green curry or simply add more fresh basil. Like I said, I’ve been adapting the recipe for years. *While I used an immersion blender for my soup, a regular blender works just fine. In a large, preferably deep mixing bowl (or blender, if that’s what you choose), combine avocado, cucumber, basil, olive oil, and spices. Add about 2 cups of water and pulse, then slowly continue to add more water and combine until soup is creamy (no chunks!) and you reach your preferred thickness. 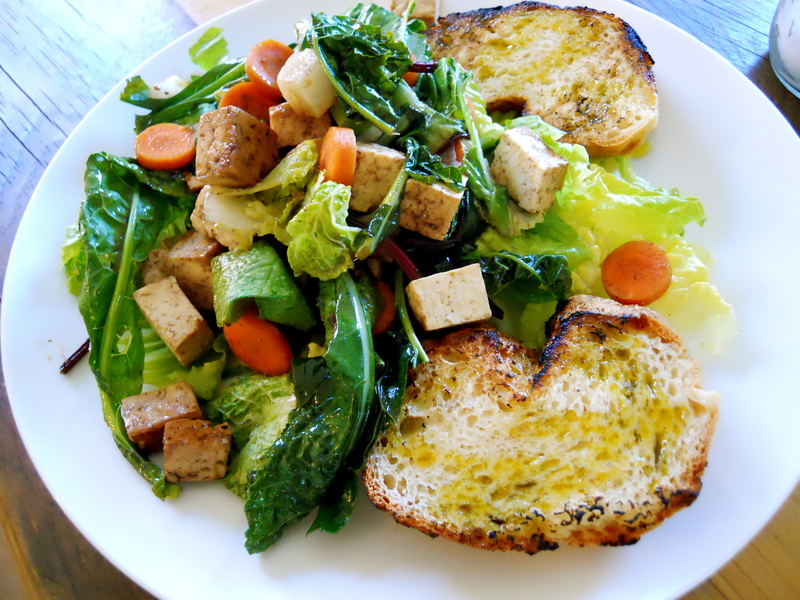 Garnish with fresh basil and a drizzle of olive oil, or gluten-free croutons. Serve right away or chill for an hour in the fridge. Your choice. The author of this blog substitutes hing powder (below) for the flavor of onions, garlic, or leeks due to her yoga lifestyle and practice. If I can get my hands on some hing, I’ll be excited to try this; otherwise, I may substitute the garlic and leeks back in. We’ve finally torn down the white flag from over our house. The quarantine is officially over. Eric and I celebrated the break in our recent mono/strep throat epidemic by running errands. I know. Exciting, right? But even though I was able to return to work earlier last week, to have both of us out of the house and going somewhere (besides the doctor’s office), even if that somewhere was just to market and then the used bookstore, was bliss. I tend to chop up and freeze my larger pieces of fruit (banana, pineapple, mango, etc.) ahead of time so I never have to worry about the ice : fruit ratio. The following recipe reflects measurements for frozen fruit; adjust your liquid, fruit, and ice amounts accordingly if using fresh fruit. 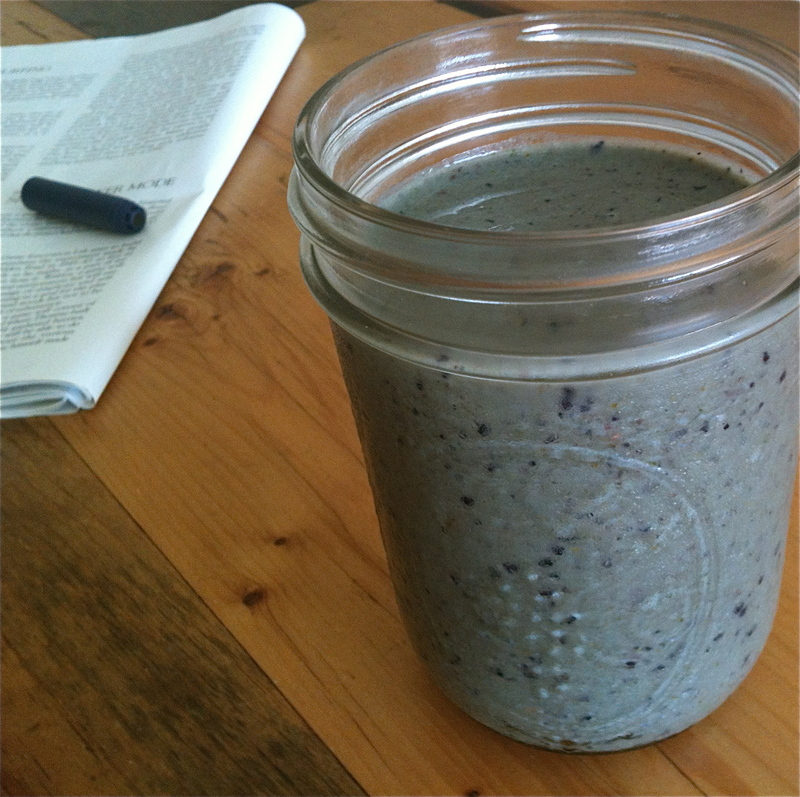 To make: Although this recipe can be doubled and made just as easily in a blender, I use a Mason jar for simplicity. In a 32-ounce Mason jar, combine all ingredients, save milk. Once all ingredients are in jar, pour milk until it just covers the other ingredients. Using an immersion blender, blend until smooth, adding more milk to adjust consistency. Serve right away. A couple weeks ago, we said goodbye (officially) to some of our dearest friends in Tucson. 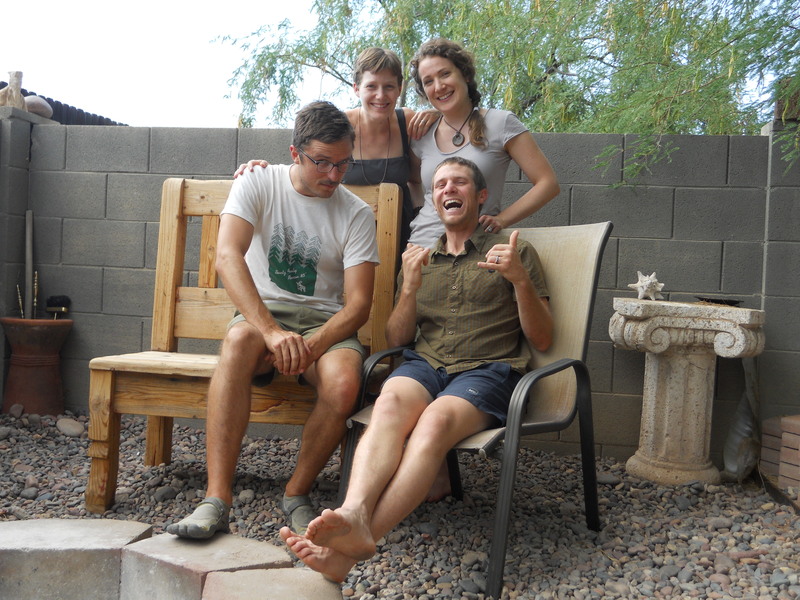 We met Scot and Kristin soon after moving to Tucson in 2008 and started having dinners with each other soon after. Eric and I were both touched by how present and open both Scot and Kristin were to building community wherever they were. A year later, when we both moved into the same neighborhood, we knew that community would continue to build. After four years and countless dinners, hikes, birding expeditions, crafting projects, and gift making, Scot and Kristin are moving on the next chapter of their life together. They’ve moved to a small town in southern California, where Scot will be working for an outdoor conservancy, and Kristin will be starting her very own massage business.We will miss them terribly, but: we’ve decided that the 8 hour drive can certainly be done on a fairly regular basis, and we already have a trip planned to visit in the next couple weeks. Community continues to be nurtured even as it grows. 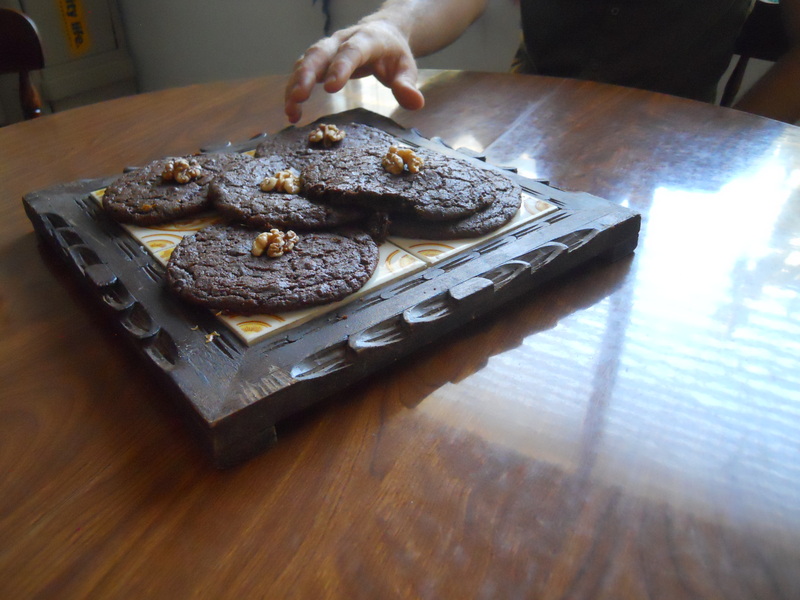 During our last get-together, we made these chocolate black bean cookies (I know: black beans and cacoa? Who would have thought? ), and I must say, they were great. Do make sure to cut the salt by about half, though; otherwise, that’s all you’ll taste. My “adjusted-salt” recipe is below. Thanks, Scot and Kristin, for everything!